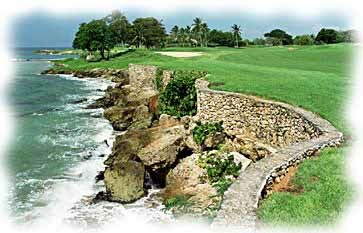 Teeth of the Dog golf course designed by renowned architect Pete Dye opened in 1971 and has long been revered as the best golf course in the Caribbean. The course has some of the best views in golf, seems somewhat forgiving and manageable, but tends to bare its teeth at least once per round. Since its’ opening, the Teeth of the Dog has consistently been ranked as one of the top 50 courses in the world. 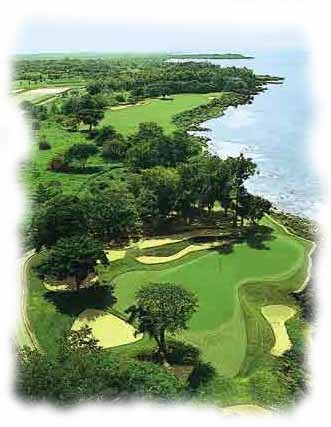 In 2002 the course ranked 35th in the world in golf Magazine’s rankings. This is an exciting championship golf course. I will never forget seeing the match of Freddie Couples against Raymond Floyd here. Freddie was at eight under and set to break the course record when he donated a ball to the surf on one of the seaside par 3’s making double bogey. The dog’s teeth have ample opportunity to bite with holes like number 5 that sit you on the ocean’s edge firing at a peninsula green 175 yards away. Seven is a similar hole, but 224 yards riding the onshore breeze. Plenty of other holes offer risks of overshooting the green, feeding your balls to the fish. Pete Dye, refers to it as economic development – because the local Dominican kids collect them and sell them back to the tourists. 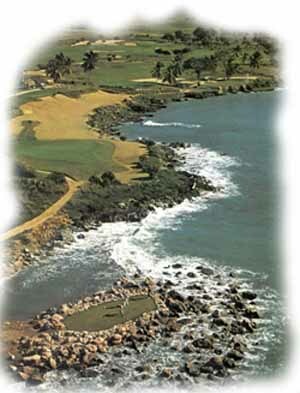 The signature hole is a par three nestled in a rock cove on the ocean’s edge shaped like a dog’s snapping jaws. As if the scenery weren’t captivating (and terrifying) enough – the foam spraying off the rocks makes it difficult to concentrate on your shot. This is a beautiful and fear filled golf course, if a professional tournament was played at Teeth of the Dog golf course, you would see four day scores like 68-80-67-83. Without even feeling like you’re hitting the ball any differently, you never know when the dog’s teeth are going to reach out and bite you. Teeth of the Dog is not a cheap course to play, rates for players from outside the hotel are usually around $235 US. Sounds like a huge amount of money to pay, but how many times are you going to get a chance to play a course like Teeth of the Dog. It’s like going to Scotland and not playing the Old Course at St. Andrews. You’re looking at about a 75-90 minute taxi ride from Punta Cana, which isn’t too far to venture for a round of golf. Here's a website that offers rate info for Teeth of the Dog Golf Course. This is the number for the starter at Casa de Campo. You can try to call in advance, but advanced booking for Teeth of the Dog golf course is often given to hotel guests only. If you’re not able to secure a time, call the starter once you’re there at least one day in advance, at 809-523-3333 Ext. 3158.